During last years trip we found it extremely challenging to be accurate with our casts and place the nymph rig where we wanted it. The totally new stroke technique compared to a regular fly cast presented a real challenge. Things were not made easier by strong winds over the open fields where we fished. Also, some parts of the narrow, but relatively deep and fast flowing river were covered by overhanging trees that challenged even the more experienced caster and definitely challenged the patience of our ”teachers” at the same time as it dug deep empty slots into their custom Euro-Fly nymph boxes. The wind caused slack and often tangled the long nymph-leader around the rod tip. We also had problems loading the faster tournament rods to create enough velocity in the rig to get the projectory of the forward stroke right. More often than not, we beginners would aim the cast towards the target, only to find that the nymphs landed way off in a totally different direction. It turned out that we did better with a rod that flexed a fraction deeper and was a little more ”connected” through the middle parts of the blank than the Comp-rods that seemed to have comparatively softer top halves and stiffer bottom halves, making them harder to load from the bottom. We mutually found this to be a pattern for us less experienced nymphers. This then turned out to be the goal in our design-work, to create rods that were easy to load, yet maintining a fast and exact recovery speed with fast dampening of the blank, created by low swing weight and the use of highest possible graphite moulus aided by low resin content for lightest possible material weight. They should also be able to carry a light normal flyline and present a dryfly or nymph in a traditional way at short range, however this not being the prime ambition. The action of the LPs rods can be described as a “forgiving” Medium/Fast Flex that tolerates operator errors without sacrificing performance when loaded in the correct way. Tip sections are rigid, yet soft enough to manage very thin Euro style leaders down to 6 or 7x without risking too easy break offs. The low, profile half wells grip has collected its shape and measurements from the custom design on Lewis’ competition rod. It features a long down taper that almost meets the blank diameter in the front. This makes it very easy and comfortable to slide the index finger over the front and on to the blank for maximized sensitivity, control and comfort during fishing. The down-locking reel seat is instrumental in balancing and in reducing the swing-weight of the rod to a minimum. 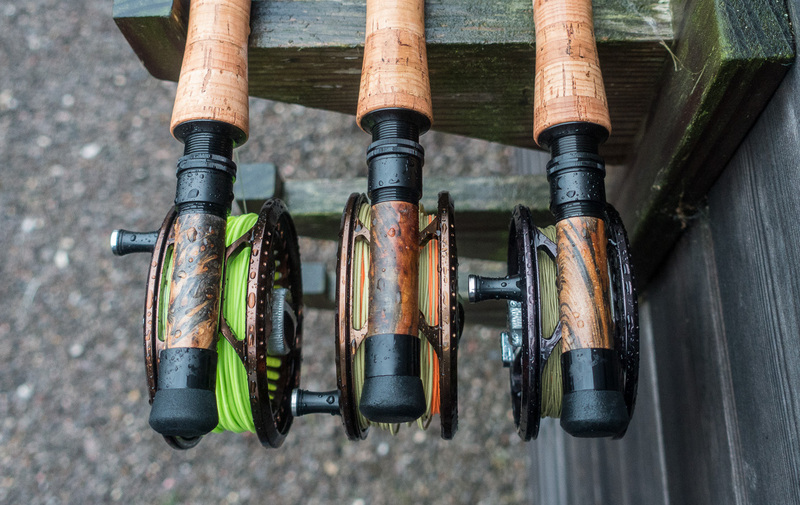 When the rod is rigged with a reel you’ll be amazed how light these rods feel considering the price tag they carry. They stand up very well even against rods noticably ”pricier” rods as well. As these rods mainly see very little flyline running through the guides, we concluded that we could keep running guide sizes small and stripper guides minimized both in size and numbers as well. This definitely benefits the action and the swing weight of the blank. While still maintaining fairly tight guide spacing, the small size of the guides also reduce the risk of line tangles. This becomes especially evident during windy conditions and when fishing the longest and thinnest leader set-ups. LPs 9´6″ #2 – This model is ideally suited to small streams and rivers where accuracy and stealth are key. It allows anglers to fish the lightest of tippets with confidence. The model picks up even the subtlest of takes. LPs 9´9″ #3 – This model is a perfect all-rounder for small streams to big rivers. It is capable of handling light tippets and strong fish with ease. The length and weight of the rod help anglers to control flies for long periods of time without tiring. LPs 10´ #4 – This model is designed for those targeting predominantly bigger rivers and fish, where bigger flies and better fish handling capabilities are important. Like its lighter equivalents, it still offers excellent bite detection and the ability to use light tippets. All model of the LPs rods are now available at Guideline dealers across Europe. Below you find a full image gallery, just click the first image to see them in full screen view.